If you are terrified of starting online and really do not know where to start then I have some great news I have just completed a Newbie’s startup guide. 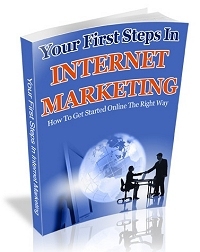 Internet Marketing For Newbies. This is a step by step account of how you can start your online business today! Part 1: Making a start, which explains the basics of starting online the how to do rather than the how not to do. Give your business the edge by looking professional from the start. Part 2: How to promote your site, driving targeted customers to your products and services and how to launch a simple marketing campaign. Part 3: More advanced tactics, the information that will give your sites and your business the edge over the competition and how to stay ahead of the competition. Hi Rob, Thank you for your most generous gift! I read it immediately. I like your writing style. You’re able to explain complex ideas with the fewest amount of words which makes for easy and enjoyable reading. I look forward to your upcoming launch because I’m sure that many of my subscribers and twitter friends will be interested. All the best, Steve D.